It’s no secret that I really enjoy a bit of outdoor cooking. 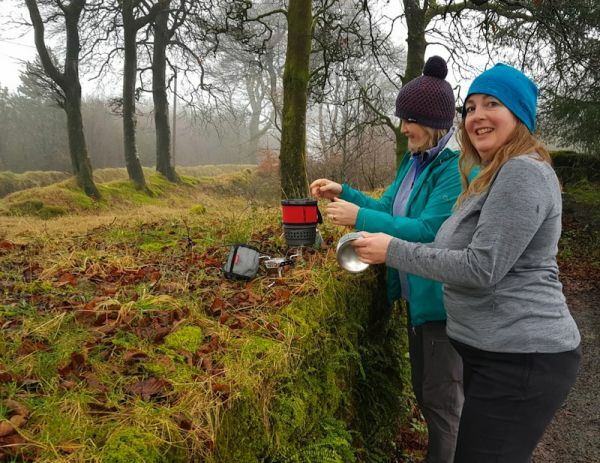 For that reason I am always keen to try out new backpacking stoves and was thrilled when I was asked to try out the Coleman Fyre Series of backpacking stoves. 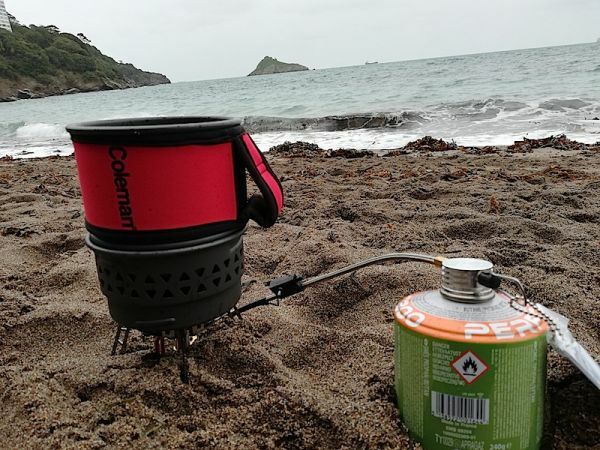 I chose the Coleman Fyrestorm PCS Backpacking Stove and the Coleman Fyre Alpine Stove. Blonde One and I had fun playing with them on Dartmoor and, for a good wind test (and a rather delicious cup of tea), I took them both down to the beach. It is far easier to site and level a stove with only three touch-points than one that sits on top of a gas canister. Having the canister to the side of the burner reduces overall height and thus knocking-over potential. The burner lit easily with the ignition, lived up to Coleman’s claims both in the wind and out of it and I enjoyed a hot cuppa in almost no time at all. 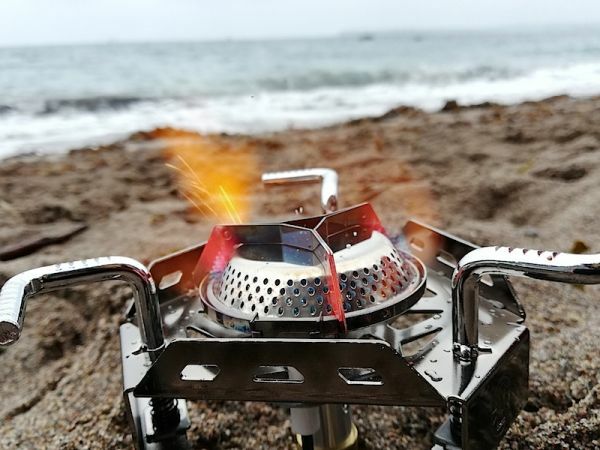 This is a neat backpacking stove that (once the instructions have been read through a couple of times) fits together with a C300 canister inside it. I wasn’t initially sure of the fit between pot and burner but got used to this in time. This is a good sized backpacking stove that is maybe too much for a single traveller. It has a built-in strainer in the lid (ask B1 how often I have moaned about my lack of camping colander) and the lid fits well, perhaps too well for easy removal. I liked this simple backpacking stove as soon as I got it out of the box. Far sturdier than the average lighter weight burner, the Coleman FyrePower Alpine has the look and feel of something that has been really well made. 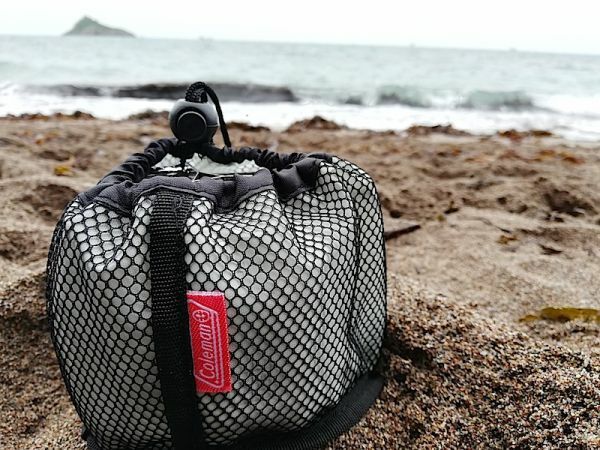 With a nifty spring system to swing out the combined steel pan supports and legs and a long braided steel hose for independent gas canister positioning, this burner packs neatly into a 9 cm bag and can be stowed separately to the gas in your rucksack. I haven’t worked out yet whether the accidental water spillage I experienced whilst using it was due to user error or whether the lack of teeth on the pan supports were to blame (it does have small ridges to help stabilise a pan). The wind baffles were effective enough to give a steady flame but sadly I had no spare water and was unable to time test it against the Fyrestorm. I predict that I am going to enjoy using this burner and that it might find its way into my rucksack more times than my present stove does. With the capacity to hold a decent size and range of pans and it excellent wind resistance, I can see that this is the stove for a Blonde who likes cooking.